Lo Yiu Wah (Lo Sir) hails from a family of disciplined workers. He, however, is a teacher of a notorious public school. One day, he was urged to resign after his students accused him of being a peeping tom. After resigning, Lo Sir decided to pursue his dream of being a police officer. He was instead offered to be a police undercover as the triads have expanded their network into schools. Lo Sir is reassigned back to his former school, Lam Tin Kwong. After his return, Lo Sir meets a new teacher, Ho Miu Suet (Miss Ho), and is impressed by her passion and enthusiasm. Lo Sir also learns that he was too strict with his students in the past and tries to befriend them. Miss Ho is determined to boost her students confidence and invites bowling expert, Koo Ka Lam to coach them. When Lo Sir finds out about Miss Koo's triad background, he decides to pursue her, hoping to get to know more about the triads. Lo Sir also finds himself in competition against the buffed Inspector Ching Man Lik, who has been assigned as the new liason officer for the school. Inspector Ching is interested in Miss Ho, but she only has her eyes and heart for Lo Sir. Slowly the four of them, Lo Sir, Miss Ho, Miss Koo and Inspector Ching find themselves embroiled in a complicated love rectangle. Despite the fact that he comes from a long line of disciplined workers, LAW YIU-WAH (Moses Chan) is a teacher of a notorious school. One day, he was urged to resign after being vilified by his students as a peeping Tom. At present, the triads have expanded their drug network at local schools. WAH, who has turned a cop, is told to go undercover at the school where he used to teach. At school, he is impressed by the enthusiasm of a new teacher HO MIU-SUET (Tavia Yeung). He also comes to realize he was too strict with his students in the past. With a determination to boost students’ confidence, SUET invites bowling expert KOO KA-LAM (Linda Chung) to teach bowling at the school. When LAM learns about her triad background, he decides to go after her hoping to learn more about the triads. LAM also finds himself in a contest of wits with Inspector CHING MAN-LIK (Ron Ng), who has been assigned to work as a liaison officer at the school. On one hand, MAN is attracted to SUET but on the other, she only loves WAH. All of a sudden, WAH, SUET, LAM and LIK find themselves involved in a complicated love polygon. *Tavia Yeung will be playing a teacher. *The series revolves around bad students. *Moses Chan will play a cop who goes undercover as a teacher to investigate Linda Chung's brother, who is a triad member. Moses will be playing a very strict teacher. *Moses and Ron Ng will both pursue Tavia Yeung. Although he likes Tavia, he gets close to Linda, even pretending to fall in love with Linda to further his investigation. *Tavia will play a teacher of liberal studies and physical education. She is also a PE teacher. *Ron will play an inspector of police. He is an up-and-comer in the police force, who is responsible for a number of schools. He will have a romantic storyline with Tavia and Jess Sum. Because his girlfriend forces him into a marriage, he falls in love with Tavia. He can get any girl he pursues, except for Tavia, who does not care for him. *Linda will play a bowling instructor. Her character is very cool and does not joke much. 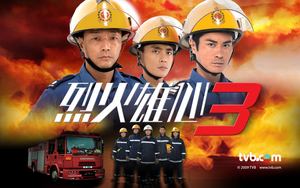 *Lee Sing Cheung, Lee Kai Kit, and Stephen Wong will play cops. *Angel Chiang will play a bad student named Lam Lai Heung. She is a very vain girl, who is also very flirtatious. *Eric Li will play a triad member.